This entry was posted on Wednesday, January 2nd, 2019 at 9:37 pm and is filed under . You can follow any responses to this entry through the RSS 2.0 feed. You can skip to the end and leave a response. Pinging is currently not allowed. Hi, I was wondering how open play worked. I just moved to New York and I have a few friends who have all played volleyball and we wanted to play somewhere for fun. Is this like an open pickup style play? Also, do we need to pay? Hi Patrick. Welcome to NY! We have Open Plays just about every week for many levels of play. Players register individually (and pay) through the specific Open Play’s web page, and the teams will be made in advance. When players arrive for Open Play, we will announce teams and play a round-robin sort of format. The cost is $15. 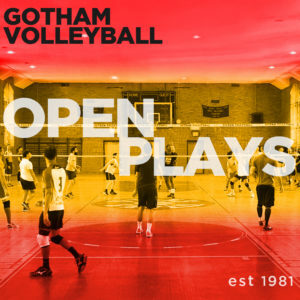 visit the About Open Play page for more info. If you have any other inquiries, you’re welcome to email [email protected].